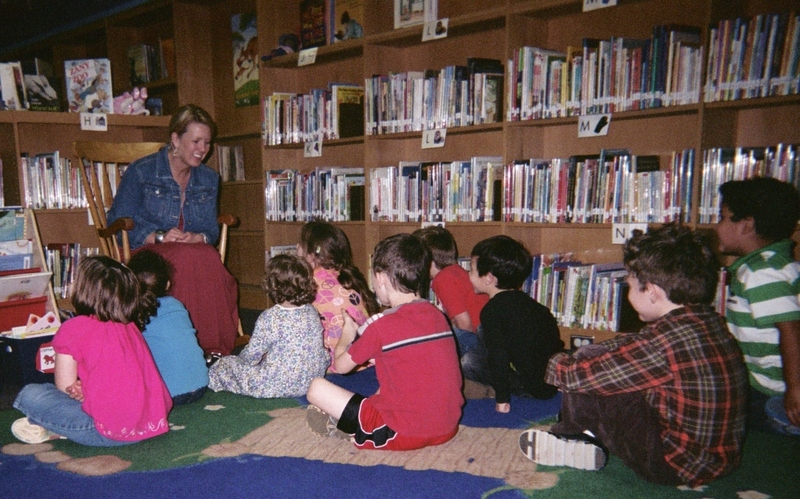 Is your weekly visit to the media center/library like most elementary schools -scheduled as a “special?” Special is an apt adjective for many of the strategies that media center specialists/librarians use to help kids get on task quickly when they visit the wonderful world of books and computer-generated programs. Class periods in the library or computer lab fly by; media specialists want to make the most of their time with students. No wonder they need attention-getters! Attention-ology tools and tricks that librarians use can also be implemented effectively by teachers in their own classrooms. Meet Sarah Luvender, a K – 5 Media Center Specialist, shown in my blog pic below. See what you think of her trick. She welcomes K – 2 kids to a magical space with a colorful pond-design rug, complete with cattails at the pond’s edge where the children sit for story time. Library friends get ready for story time. Ms. Luvender begins the poem and the children respond, first to her welcome, then to each question before Ms. Luvender says it’s time to get started. As she and the children sing the poem aloud they gently act out the lyrics. This activity especially helps squirmy kids settle down for the story to come. Welcome. welcome, my library friends. Hello, Ms. Luvender, we’re ready to begin. In our laps, so they don’t get lost. So let’s get started my library friends. Aoccdrnig to a rscheearch at Cmaabrigde Uinervtisy, it deosn’t mttaer in waht oredr the ltteers in a wrod are, the olny iprmoetnt tihng is taht the frist and lsat ltteer be at the rghit pclae. The rset can be a total mses and you can sitll raed it wouthit porbelm. Tihs is bcuseae the huamn mnid deos not raed ervey lteter by istlef, but the wrod as a wlohe. Well, some at Oxford University, home of the revered Oxford English Dictionary, might beg to differ, or at least regret the spelling mish-mash. Then again, maybe not. Intentionally mixing up words or creating whole new words is a proven attention-getter for the K – 5 (and older) set. One of England’s own, Daniel Radcliffe, aka “Harry Potter,” has had to master mixed up, mysterious sounding words in his role as a wizard for more than a decade. Radcliffe spoke about the emotional power of words in a recent interview published in Parade magazine. He talked about how he loves to write poetry. Do you suppose that Daniel Radcliffe had a teacher in his early years who read stories to him like Sarah Luvender reads to her young students? 1 Pings/Trackbacks for "Try a New Story Telling Trick"